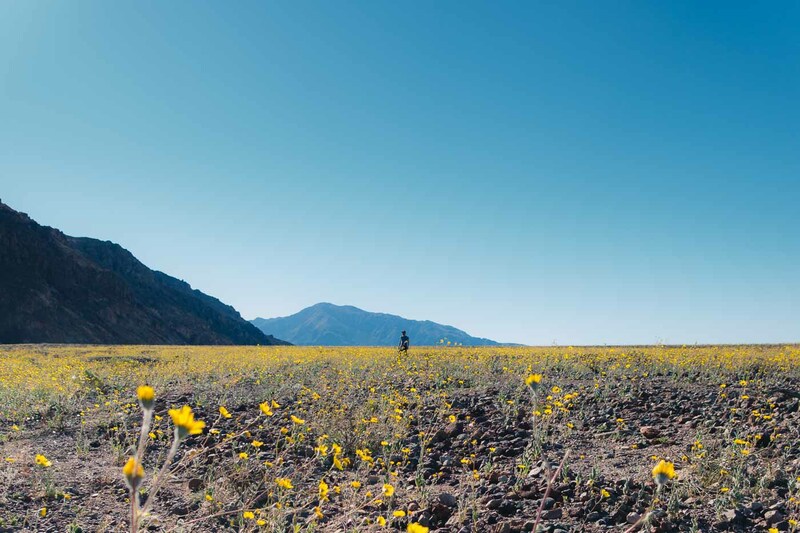 After receiving substantially more rain than typical in the 2015-2016 winter season, Death Valley National Park is experiencing a rare “superbloom” of wildflowers. The last superbloom event was 11 years ago, in 2005. 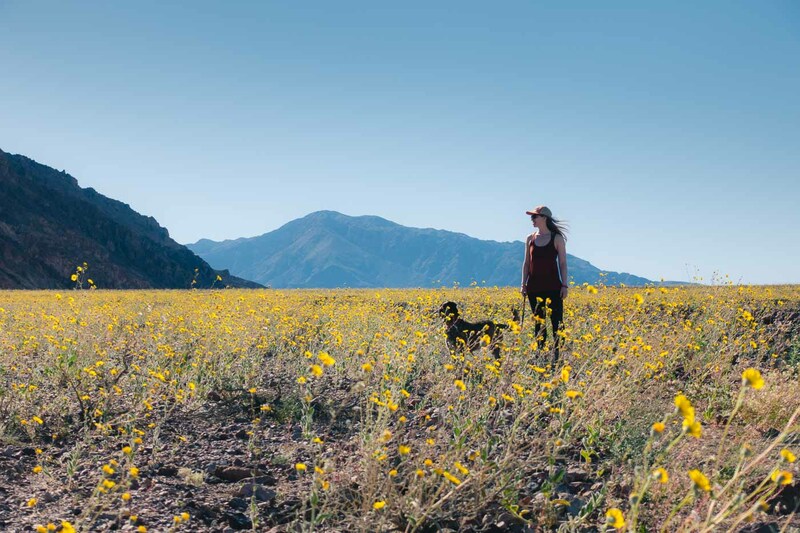 Since missing this year’s superbloom could mean waiting another decade or more before it happens again, we knew we had to go see this rare event. When we decided to make the trek out to the park, we quickly learned that accommodations would be difficult. 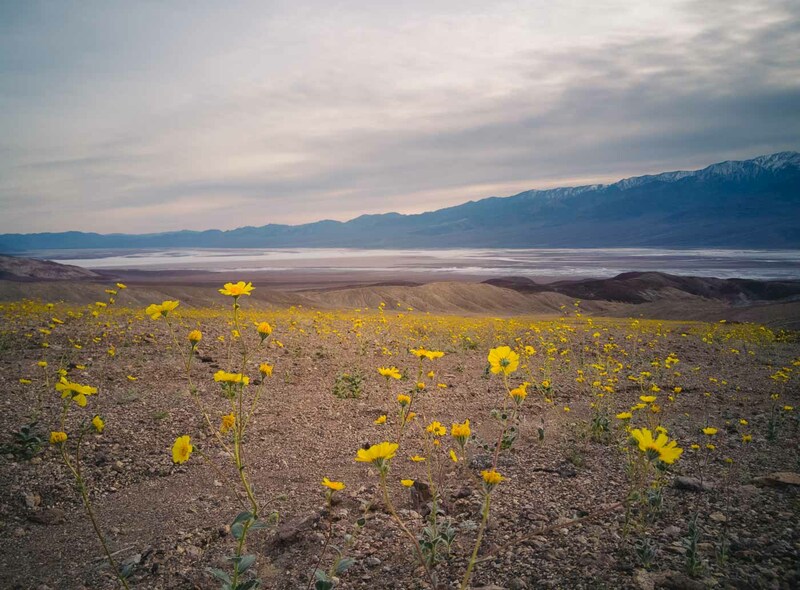 News of the superbloom has already spread and finding a hotel room or campsite at the limited choices in and around Death Valley National Park would be difficult. Rather than search high and low for a place to sleep (and not in the mood for backcountry camping) we booked an Escape Campervan. We figured that, at the very least, we could pull off to the side of the road and deploy the bed in the Campervan to catch some shuteye. We visited the park mid-week and had no problem getting a first-come, first-served campsite at Stovepipe Wells around 1pm. It seemed full later, though. 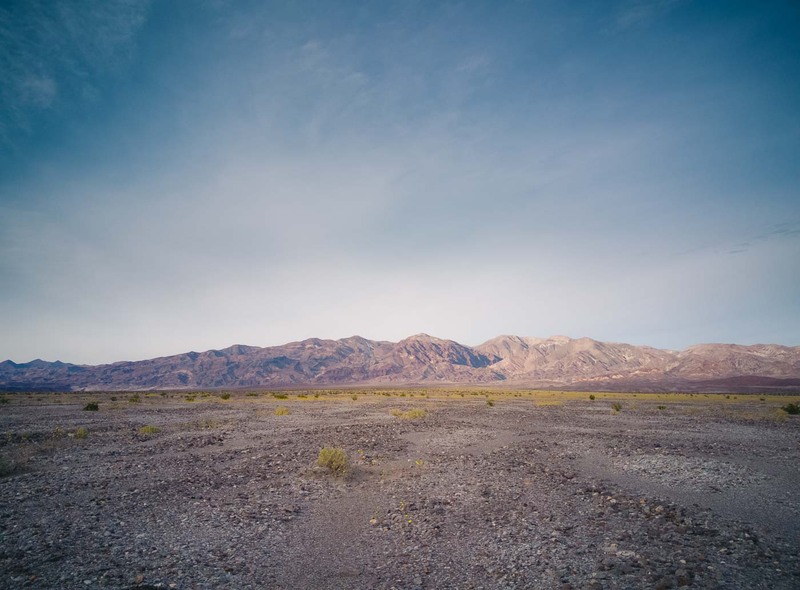 More on camping at Death Valley here. Before entering the park, we checked the Death Valley National Park Wildflower Update 2016 page. There they have the latest news on the state of the wildflower bloom including a helpful map of the bloom areas around the park. 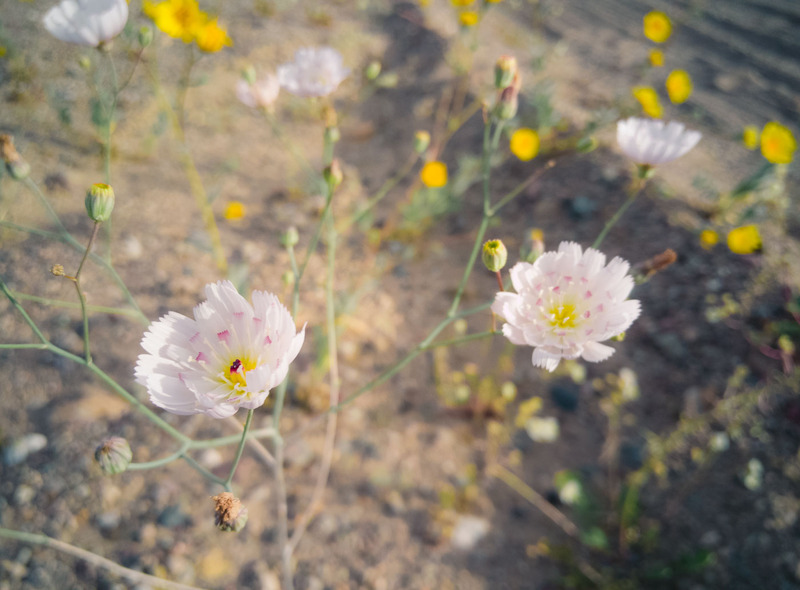 If you’re trying to catch the last remnants of the superbloom, definitely check the latest reports to learn where the best spots are. Upon arriving to the park, we promptly searched for the first signs of the superbloom. Our first stop was along the main highway 190 through Death Valley, just south of its junction with Scotty’s Castle Road. 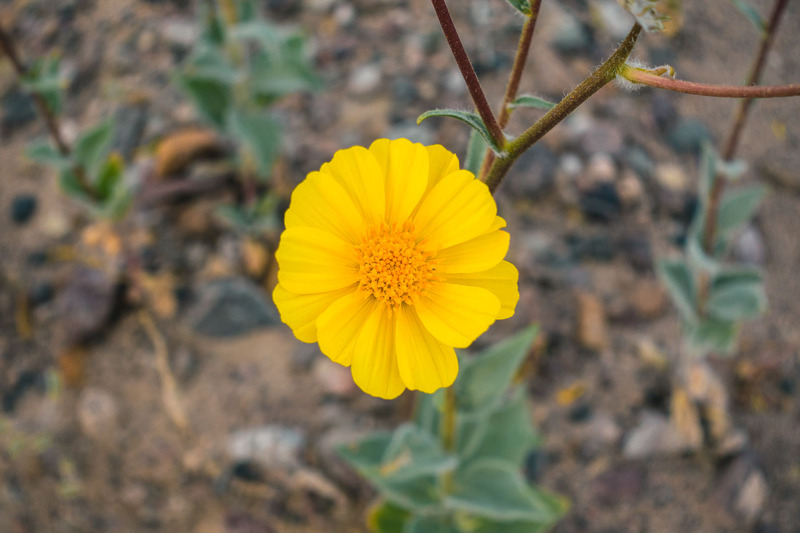 At first, the bloom seemed to consist of almost entirely yellow Desert Gold flowers. But we explored the fields of flowers on foot and found that there was a little more variety to the colors: white, pink, and purple, too. 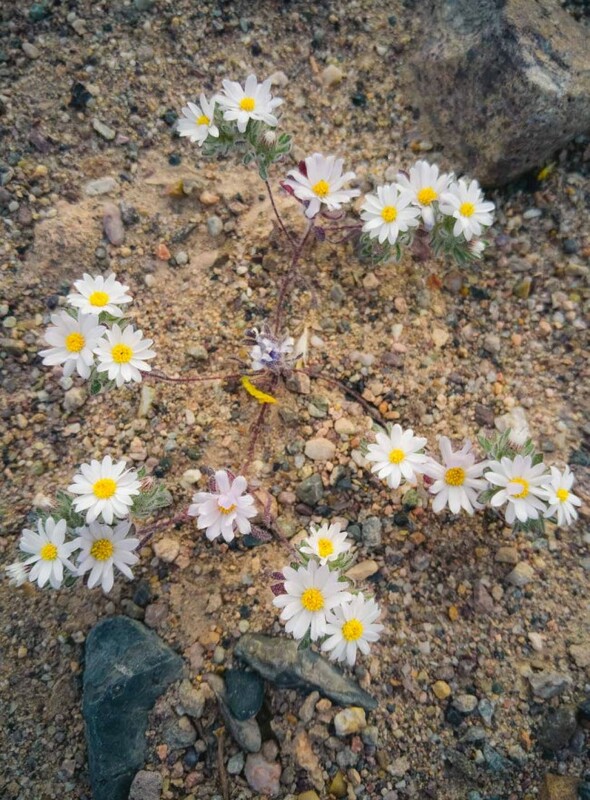 The individual flowers tended to grow somewhat far apart (around 3 feet on average), and they were spread over wide areas of the valley floor, especially on the numerous alluvial fans (wikipedia) that spread out from the surrounding mountains. For photos, we found that we could capture the size of the bloom best by crouching low, and even zooming-in to capture the most distant flowers. We also found a great display of wildflowers along Artist’s Drive. 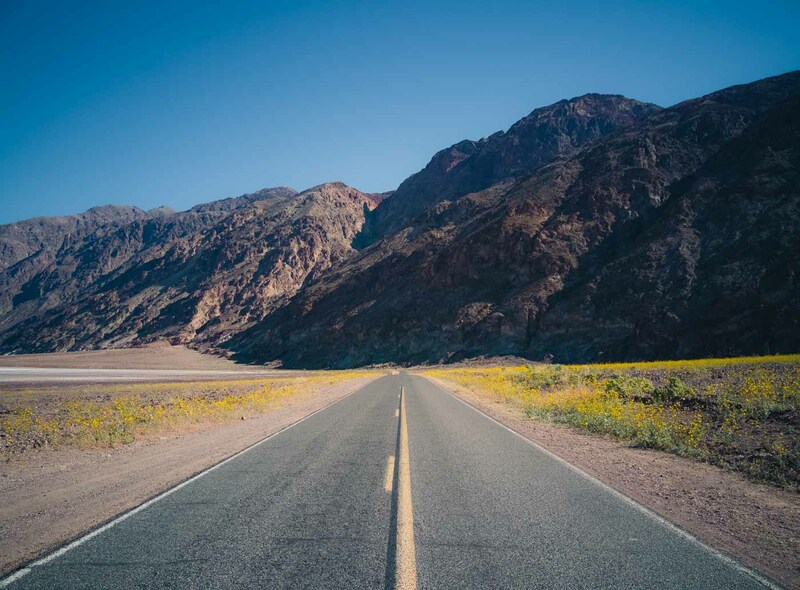 The winding one-way road snakes through the eastern foothills of Death Valley and overlooks the dry lake bed of Badwater. On our second day, we traveled toward Badwater and found the most dense concentration of wildflowers a few miles south of the Badwater parking lot. How “Super” is the Superbloom? 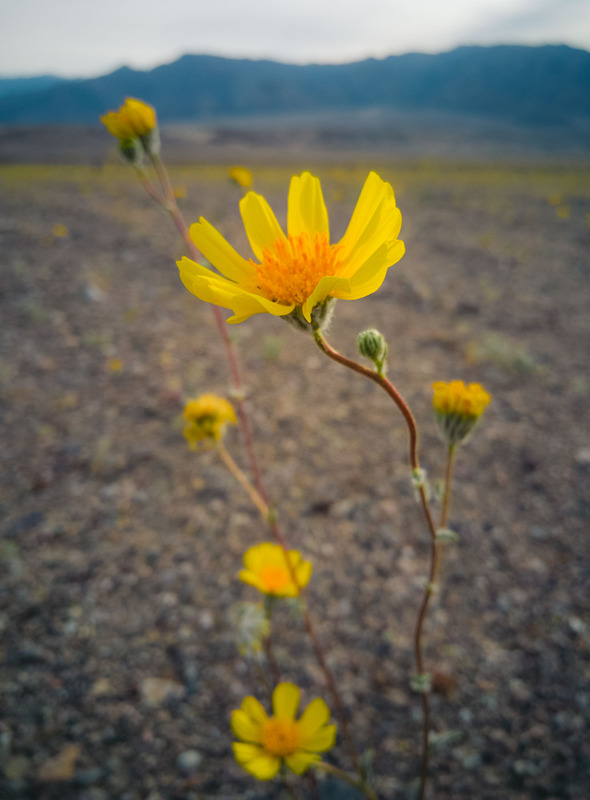 Having visited Death Valley numerous times in the past, I’m familiar with how much the bloom has changed its appearance, and thus we thought it quite beautiful on our visit. 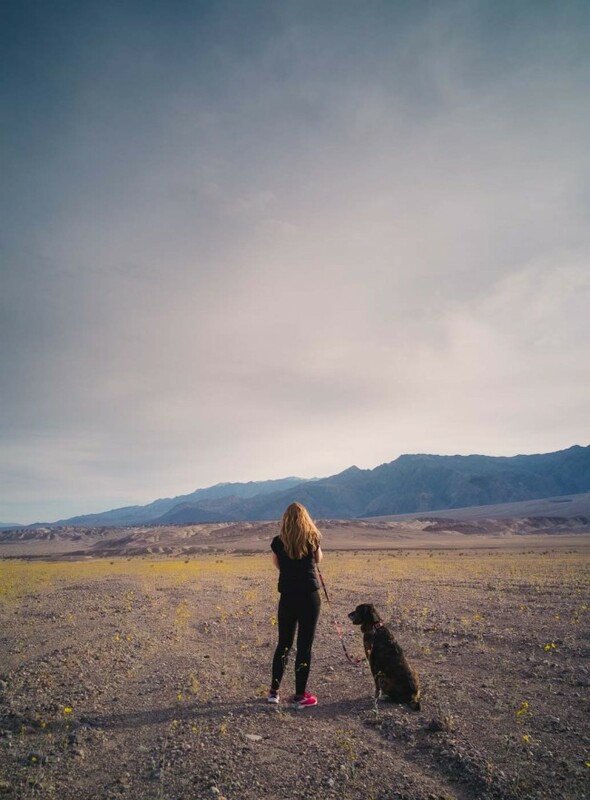 Normally, Death Valley lives up to its name: a dry, barren wasteland consisting of white salt flats and dark earthen colors. Here’s what you can expect: The most noticeable and abundant flowers are yellow. The flowers tend to grow densely along the roadside, and they’re spread across vast distances in the valley. They are spaced several feet apart, so it’s not a solid gold you’ll see gazing across the valley. At many angles, though, (and even more so in the morning or late afternoon sun) the views are quite spectacular. Check the park’s bloom map and go where the flowers are marked. Experience it in the morning (before 9:30am PST) or late afternoon (after 3:30pm). The colors appeared more vibrant when the sun was lower in the sky. Get out of your car and walk into the bloom areas. It’s better than the view from the road! While the 2016 bloom is reportedly past peak, the National Park service says that if the wet weather of El Niño continues, the bloom could last through April of 2016. All photos were taken by Ian and Diana with the Sony RX100 III (Diana’s camera — review here) and our smartphones. In March 2014, Ian and Diana called it quits on their traditional American lives and set out to explore the world. They now live a sustainable life of full time travel, working for themselves and seeking adventure at the same time. Here on North to South, they document their journey in achieving and maintaining this "road less traveled" way of life.